This is an awesome bedding set!!!! Love it, Love it Love it!!!!! 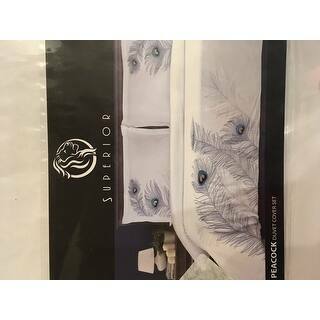 If you love peacocks this is The bedding set for you or a loved one or friends!!!!!! Update your bedroom decor with this eye-catching peacock duvet cover set made of 100-percent cotton. 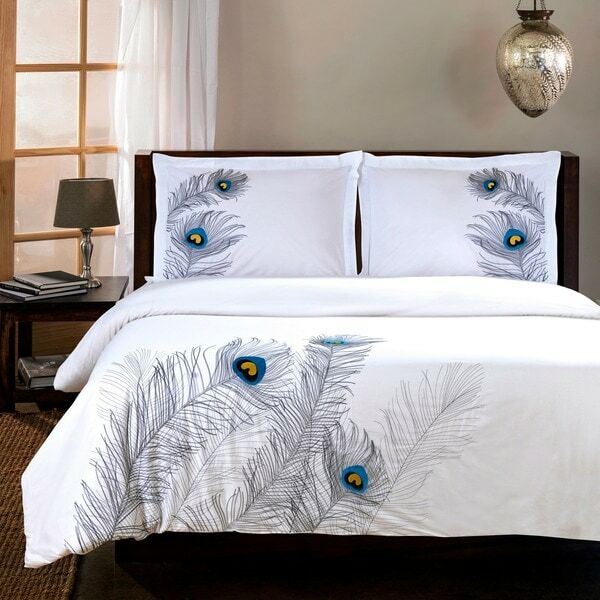 Large embroidered peacock feathers add an exotic feel to this three-piece, 200-thread-count cotton duvet cover set, which includes one button-close duvet cover and two pillow shams. I took a chance with virtually no reviews on this product and I was very impressed! The embroidery is beautifully done and shimmers in the light. You won't be disappointed with the quality of the stitching. The one review I had to go from said that the color of the duvet is much darker than pictured, and that's true. It's actually a dark khaki color. Pay close attention to the photo because it was obviously taken under bright lights. The curtains in the background are white, so don't expect the duvet itself to be white or even a light tan. The linen is a very attractive but darker neutral that will go nicely with dark wood furniture. I can't comment on how the duvet washes or wears, but if you're liking the large embroidery then go for it and see for yourself! Although the peacock feather embroidery is very beautiful and well-done, the color of the fabric used for the duvet & shams is a horrible greyish, dead-looking color. It's nothing like the picture shown on the website. Had to return it due to the awful fabric color. As always, Overstock was very helpful and gracious with the return process. We try to represent all colors accurately; however due to the difference of monitor colors, some colors may vary slightly. We have verified the image is an accurate depiction of the product. Beautiful duvet cover! Looks very expensive! I love this duvet cover, it's so pretty and the embroidery is really nice quality. No snags or loose bits of cotton, it doesn't pull the duvet cover around it (which some cheap embroidered duvet covers do). I just washed it in hot water and tumble dried it and it still looks the same. No shrinkage anywhere or bleeding colors. I'm very happy! A lot of the negative reviews are because of color which may confuse those looking to order. The pictures clearly show one duvet that is bright white with grey feathers and a blue peacock center and another that is a stone color duvet with blue and green feathers. All complaints came from people who ordered the blue green feathers complaining the duvet isn't white. That's because it's not, it's stone colored like the image shows. I ordered the white duvet with grey feathers and it looks just like the photo. It's beautiful and very intricate. Well worth it!!! Very unique. It's your average softness for 200 thread count. We sleep directly under a duvet cover with no flat sheet in between, so a duvet cover's fabric is at a special premium for us. This cotton disappoints on that point. It feels cheap and scratchy, even after a couple of washes. Here's hoping that a few more washes may soften things up. The feather design is not a print; it is embroidered on and looks pretty good, however I wonder about the long-term durability as there are already a few frayed threads. It looks good from a distance but looks about the price as you get closer. As others note, this pulls a little darker in person than shown in the photo. It is definitively not white; look at the other pillows and the flat sheet in the main photograph to see the dramatic contrast. It's grey, pulling towards an earthier putty color as opposed to straight black-and-white grey. It is unoffensive and neutral and should probably not disappoint unless you expected white, or require a specific shade of off-white. Overall, not terrible. You're getting about what you pay for. I love this duvet set. The color is a light dove gray color and the embroidery on the piece is stunning in vibrant colors. The material is soft and not too heavy and the pillowcases in the king set are big enough for extra full down king size pillows. I am not sure how it will wash, but for now this is a 10. Very nice, 100% cotton - I washed these upon receiving, and yes there are some wrinkles, tried to iron it around the edges at least, but the embroidered pattern of the peacock feathers is very nicely done and I am happy with this purchase. The duvet cover does not have any way to hold a duvet (like those fasteners that some have), but I managed to use large paper clips to hold it while I shook the duvet into place, and then removed the large paper clips. Wanted this item sold out, got it yesterday! I wanted the clean white look. I also liked the embroidery look of the peacock feathers. They are really nice. I thought they were blue in package. Opened and placed on the bed, there is a shimmery tone to the threads. It beautiful! They are not sliver, but the blue shimmery thread gives it a more rich look to it in my opinion. Not to girly, for a couples bed. He didn't even see the shimmery threads. I am happy with the look. Now with my multiple purchases of duvet covers I am set. Thank for your outstanding quality and variety of products at Overstock. I have a new bed and all the new dressings for it a women would want. Very pleased! I am pretty happy with the duvet cover set. It is not white as it seems in the picture which was fine with me actually. The color is more of a greyish color but it really brings out the brightness in the feathers. I really like the peacock design, but was expecting white. Due to the khaki/gray color of the fabric, I had to get creative by pairing livelier sheets. This is a nice, gender neutral set for the lady looking to decorate without going overboard on girlish colors. The color was not right. I was expecting white . The color was not all what I expected---kind of like a gray clay. The embroidery was beautiful. Even so, I was going to return it until my husband said he like it. Now it is on our bed and I am getting used to it. The material is very soft and feels good against my skin. But it is really lacking in color and needs colorful pillows and/or sheets to perk it up. The picture of it was very deceiving. Great material with inside corner ties to hold comforter in place. Love this duvet! It is good quality and comfortable. I'm glad the other reviews mentioned it was a khaki color. I personally prefer that to the white I thought it was originally. The embroidery is well done overall great value and purchase. I was worried that after a wash the embroidery would start coming loose but so far now after several washes it has helped up (i use cold water delicate cycle with it inside out). I like the color- its light grey. I love this duvet and sham set. Yes, the material is definitely on the thinner side, but it was exactly what I was looking for. The background is white, the feathers are stitched in black or bluish black thread with beautiful accents of peacock blue (a saturated lovely dark teal) and goldenrod yellow. I am thrilled with my new duvet set. I was warned. I read a review before I bought the "off-white" set that said it was a deadly more-of-a-pale khaki color than a naturally off-white color. While the embroidery is fine and pretty, the overall effect is not. Material is a bit thin, but love the blues in the embroidery. This peacock design is beautiful. I bought this long time ago and have been using this in our master bedroom. We change our duvet covers once every week or every two weeks. I like the bright white color that brightens the room. Beautiful duvet cover, only thing I would say is that I do wish it had the corner ties to attach to the insert. Like -fresh look, modern, well made for the price. Dislike - pillow cases must be for junior size queen bed if such a thing exists. More like Princess-sized. A queen pillow can be squeezed in, but its a tight fit and its really a "standard" pillow size - 20x 26. If the pillow cases were queen, 20x30, it would be great. How did the manufacturer miss this standard size ? The only downside to this I cannot get it in a King size. The colors are a great fit and the quality is spot on. I think I have great taste. "Does the duvet cover have tie fasteners in each corner last one I ordered didn’t and hated it "
"Love this comforter. I have in the taupe. Do they have a matching bed skirt?" "I know that the blue/green feather option comes with the taupe color for the comforter, but what color is the comforter for the silver option? Is it white? Gray? Also taupe? Thank you." "Is the comforter with the black and blue feathers silver or white? It looks white in the picture but some of the reviews say it is a darker color, and when selecting a color it is listed as "silver". Also, just to clarify, the version with light green and turquoise feathers is a khaki color, correct?" It is actually tan/beige - still a very nice cover. I was looking for a design that was NOT busy...this fit the bill. It looks very elegant and is pleasing to the eye. I know this is going to be a very pleasant addition. "Can you give better background description of color?It looks white white!" The color is very light beige.